The town, known internationally as Gallipoli, is located on a peninsula that bears the same name. Administratively it belongs to Çanakkale Province, although it is situated in Europe, and the capital of the province - in Asia Minor. Gelibolu is the largest town on the Gallipoli Peninsula, with the Aegean Sea to the west and the Dardanelles Strait to the east. Because of its strategic location, the peninsula was a silent witness to the long and extremely bloody struggle for the control of the Dardanelles Strait during the First World War. Gelibolu was founded by the Greeks in the 5th century BC, as Kallipolis ('Beautiful City' in Greek). The modern name is the distortion of its original name. From the beginning, the town played an important role, firstly because of its proximity to Constantinople, and secondly - as a naval base, because of its location at the Dardanelles strait leading to the Sea of ​​Marmara. The Byzantine emperor Justinian I fortified Gelibolu. On his orders, military warehouses storing grain and wine were built. After the conquest of Constantinople by the knights of the Fourth Crusade in 1204, and the formation of the Latin Empire, Gelibolu was controlled by the Venetians. In 1306, the town was conquered by Almogavars - special forces of the Kingdom of Aragon, serving as mercenaries under the command of the famous adventurer, Roger de Flor of Sicily. After the death of their leader, the soldiers murdered almost all the inhabitants of Gelibolu, and then withdrew from the city, previously destroying its fortifications. In March 1354, a strong earthquake caused the almost complete destruction of Gelibolu, and, as a result, the town was abandoned by its Greek inhabitants. The opportunity was seized by Suleiman Pasha, the son of the Ottoman sultan Orhan I. He quickly reoccupied the town, fortified it, and settled with Turkish families, brought in from Anatolia. Byzantine Emperor John VI, eager to regain the town, offered a significant amount of money to the Turks, for returning Gelibolu, but his offer was refused. The sultan said that the city was not occupied by force, and a gift from Allah can not be dismissed. At the news of the loss of Gelibolu, Constantinople was gripped by terror, and the Emperor John VI was overthrown. It was believed that soon the capital of Byzantium would also get into the Turkish hands. In fact, 99 years passed before the final destruction of the Byzantine Empire. However, gaining a foothold in Europe made the conquest of Eastern Thrace much easier for the Ottoman forces. Within less than ten years this territory, including Adrianople (currently Edirne), was under the Ottoman rule. Piri Reis (literally Captain Piri), whose full name was Hadji Ahmed Muhiddin Piri, Ahmet Ibn-el-HAC Mehmet El Karama, was born in Gelibol in the middle of the 15th century. He was an admiral, but his major achievements were in the disciplines of geography and cartography. His maps were collected in the form of the Book of Navigation (tr. Kitab-ı Bahriye), i.e. the atlas combined with detailed information for navigators. Interestingly, it contained not only the maps of the Mediterranean region but also some parts of the American coast. It is worth mentioning that this particular map dates back to 1513, and it means that it was made just 21 years after the discovery of this continent. Moreover, in 1929, in the archives of the Topkapi Topkapı in Istanbul, the map of the world made by Piri Reis was discovered. It was the oldest Turkish map showing the coast of the New World, but also one of the oldest of its kind in the world. During the Crimean War, French and British troops were stationed in Gelibolu, where they strengthened the 600-year-old fortifications. Their task was to defend Istanbul from its occupation by the Russians. Soon, the situation changed dramatically. During the First World War, the city of Gelibolu and the entire Gallipoli Peninsula was defended by the Turkish forces against the Allies, who were trying to seize Istanbul. During the bloody battles fought to keep the peninsula under Turkish control, a young commander - Kemal Pasha (later known as Atatürk) became famous for his achievements and bravery. The fame of "Gallipoli defender" significantly facilitated his subsequent actions as a commander during the Turkish War of Independence. Although most residents of Gelibolu were Greeks, they were not resettled to Greece, under the provisions of the Convention on the Exchange of Greek and Turkish population in 1923. They were protected from this necessity as Gelibolu belonged to the prefecture of Istanbul, where the Greek population was exempted from the resettlement. Currently, Gelibolu is a small town, with a population of about 30,000 inhabitants, famous for its canned sardines. It is also an important port for the ferries connecting Europe and Asia. Gelibolu is a picturesque town where most of the interesting places are concentrated in the vicinity of the port, and along the road leading to Hamzaköy beach district. Gelibolu comes alive every year for about one week when crowds of tourists from Australia and New Zealand arrive to commemorate Anzac Day on the 25th of April. This day is celebrated in memory of the soldiers of the Australian and the New Zealand Corps (ANZAC) who fought and died during the First World War while they fought on the Gallipoli Peninsula. If you are not particularly interested in these celebrations, you better visit Gelibolu on another date as all hotels are full, and ferries and buses - booked well in advance. The best point where you can start Gelibolu sightseeing tour is the ferry harbour (tr. Gelibolu Feribot Iskelesi). It is located in the southern part of the city, near a characteristic roundabout formed by the Old Post Office Street (tr. Eski PTT Caddesi). If you head left (to the west) at the roundabout, then after 200 meters you will get to Gallipoli War Museum (tr. Gelibolu Savaş Müzesi), on Korean Heroes Street (tr. Kore Kahramanlar). Even from outside, it is clear what the mission of this museum is i.e. to commemorate incredibly bloody battles fought on the Gallipoli Peninsula. The building is surrounded by barbed wire and sandbags designed to evoke the trenches of the First World War. Inside you will find a collection of commemorative items from this period, including letters written by soldiers to their families, as well as photos from the excavations carried out in the areas of fighting. The museum is closed on Sundays and Mondays, and on other days of the week it is open from 9:00 am to noon and from 1:00 pm to 6:00 pm. The admission ticket costs 3 TL. The statue of the Ottoman Admiral Piri Reis, standing on the quay near the Gallipoli War Museum, suggests another point of interest is Gelibolu. This statue stands on the eastern side of the roundabout, next to the Piri Reis Museum (tr. Piri Reis Müzesi). 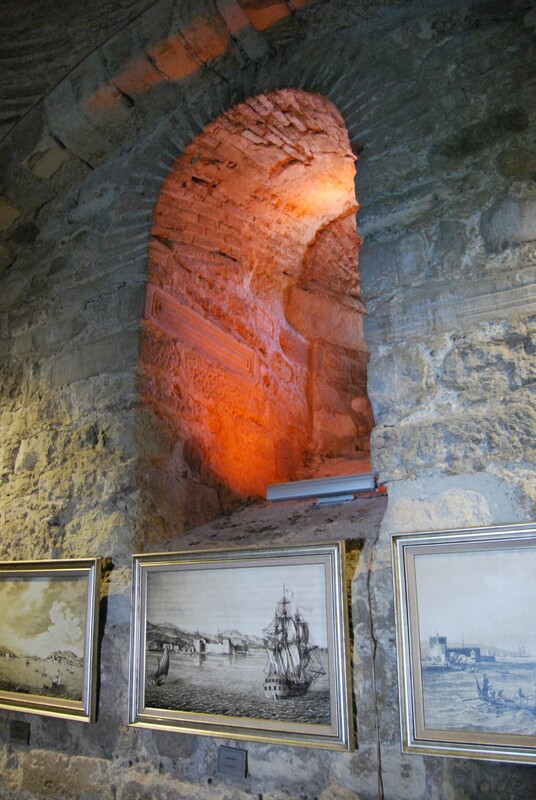 This exhibition has been organised in a stone tower, which is a remnant of the Byzantine fortress, expanded in the 14th century, in the Ottoman era. The building is the only preserved memorial of the Greco-Byzantine city of Kallipolis. The museum, opened in 1991, contains an impressive collection of sundries related to the life and works of Piri Reis, a famous cartographer, and an admiral. He was the author of The Book of Navigation> (tr. Kitab-ı Bahriye) that presented detailed information on sea travel, along with the maps showing the location of cities and ports on the Mediterranean Sea. Piri Reis has recently become the object of great interest to the media after the Turkish President Recep Tayyip Erdoğan announced to the world that Muslim sailors discovered America before Christopher Columbus. One piece of evidence for this claim was a map, drawn in 1513 by Piri Reis, which shows a part of the American continent. It was discovered accidentally, during an inventory conducted in 1929 in Istanbul's Topkapı Palace, and is considered one of the oldest surviving maps of America. This map is currently stored in Topkapı Palace and is rarely shown to the public. Tourists visiting the Piri Reis Museum in Gelibolu have to settle for much more modest exhibits, arranged on two floors of the fortress. Steep stairs take the visitors to the upper level of the building, and on its ground floor, at the entrance, there is a well, where the visitors throw coins. Among the displayed items, the engravings depicting the ships from the Ottoman era and the port in Gelibolu attract the most attention. Moreover, there are some reproductions of Piri Reis maps, including a map of the Dardanelles, several mannequins dressed in sailor outfits from the times of Piri Reis, as well as navigation instruments and cartographer tools of his era. The museum also has a collection of oil paintings, including the portraits of Piri Reis, showing the preparation for a sea voyage, the work on the creation of a map, and writing a book. The collection of exhibits also includes a gun and some weapons from the days of the admiral. 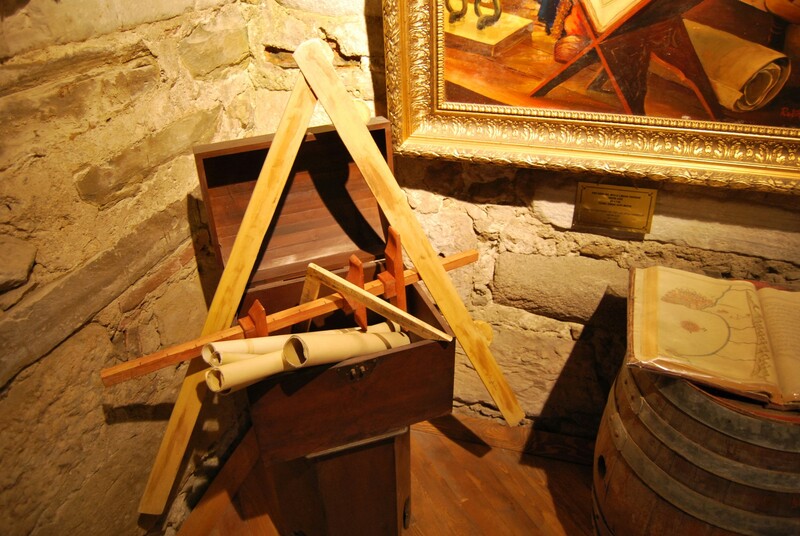 Piri Reis Museum is open daily except for Thursdays, from 8:30 am to noon, and from 1:00 pm to 5:00 pm. Admission is free. Taking photos is allowed, and we recommend taking a photograph of the city of Gelibolu from the windows of the tower. 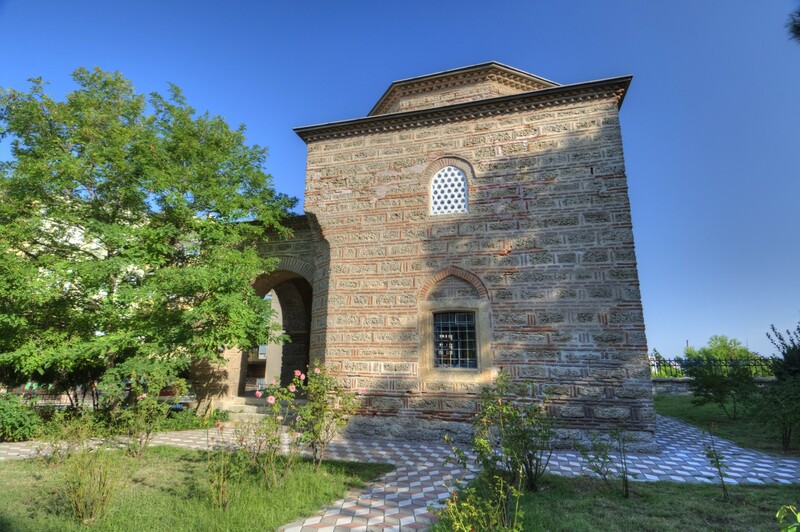 The most beautiful mosque in the centre of Gelibolu is the Mosque of Suleiman Pasha (tr. Gazi Süleyman Paşa Cami), located 350 meters to the north of the roundabout at the marina. To get there, walk uphill, along İbni Hasancik Street. The mosque was built in 1385, and its name commemorates the Ottoman conqueror of the city and the sultan's son, Suleiman Pasha. In the 19th century, the building underwent a complete renovation, and its present appearance is far from the fourteenth-century design. Look at the columns outside the building, as the mosque was constructed from the fragments of ancient structures of Kallipolis. The interior of the mosque is spacious, elegantly decorated, and extremely well lit, because of numerous windows and a roof opening. Other points of interest in Gelibolu are situated along the route leading from the harbour to Hamzaköy Beach district, located in the bay on the eastern side of the city. If you have just visited the Mosque of Suleiman Pasha, then go straight to the east, down Big Mosque Street (tr. Büyük Cami Sokak) and General Dursun Street (tr. Dursun Bak Caddesi). Just 450 meters away from the Mosque of Suleiman you get to a large roundabout where Tuğsavul and Muhittin Reis streets start. The same point can also be easily reached from the ferry terminal (900 meters), by walking down Tuğsavul Street, first to the east, and then, still following the same street, to the north. To the north of the roundabout, there is a bazaar area, and the streets are closed or narrowed on market days. 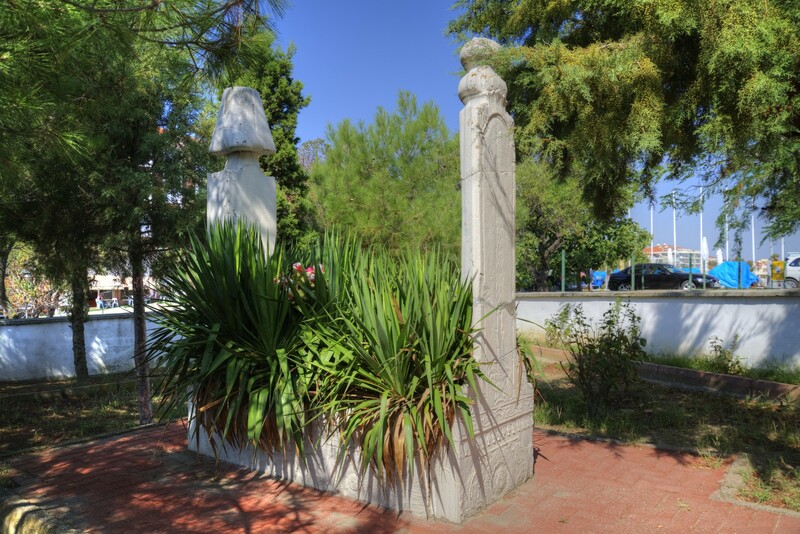 On Muhittin Reis Street, just 100 meters from the said roundabout, there are the tombs of two Ottoman clergymen (tr. türbe), bearing the names of Ahmet-and Bican Efendi and Mehmed-and Bican Efendi, as well as a mosque bearing the name of the second one. Mehmed-and Bican Efendi, who died in 1453, is a figure virtually unknown outside Turkey, but in this country his name is mentioned with reverence and respect, as the author of the famous commentary on the Qur'an, entitled Muhammadiye. If you choose to follow Tuğsavul Street, going from the roundabout to the north, after 200 meters you come to the Tomb of Mansur Al-Hallaj (tr. Hallaca-ı Mansur Türbesi). He was a Persian mystic, writer and teacher, and lived at the turn of the 9th and the 10th centuries. He became famous when he coined a phrase "I am the Truth", by which he expressed full communion with God. After many years of imprisonment, he was sentenced to death as a heretic, but many Muslims still consider him to be a saint. 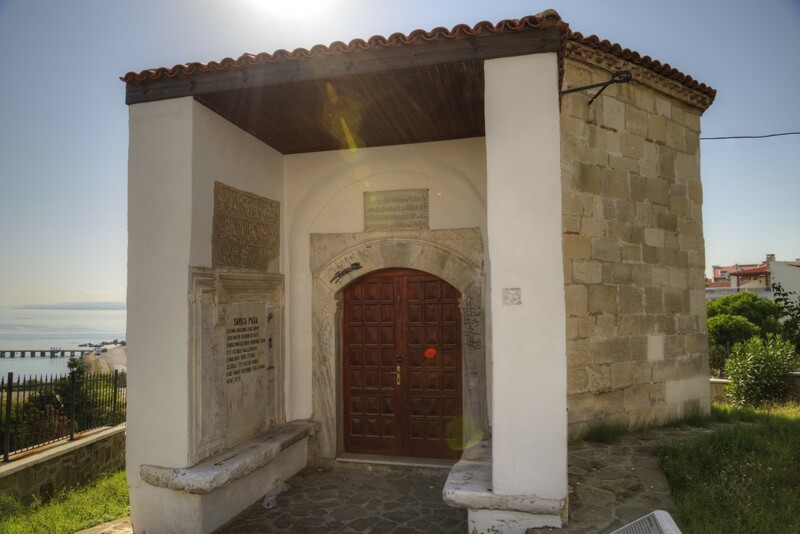 The tomb in Gelibolu was built in 1407 by Iskender Bey, and it is only a symbolic resting place of Mansur Al-Hallaj, whose body was burned after the execution. The stone and brick building, standing in a small garden, has impressive dimensions, and many tourists mistakenly take it for a mosque. 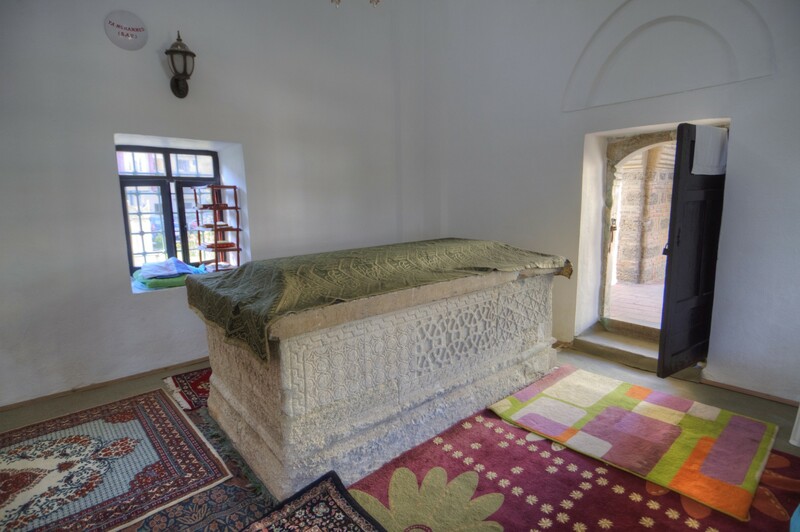 You can enter the carpeted interior and see the symbolic sarcophagus of Mansur Al-Hallaj. From the Tomb of Mansur Al-Hallaj, the tour of the city takes you to the right (to the east), along Lighthouse Street (tr. Fener Yolu). On a hillside, on the north side of the street, there is one of the most amazing tombs in Turkey. It is the Grave of Flag Father (tr. Bayraklı Baba Türbesi), thoroughly covered with Turkish flags. Here, a soldier bearing the name Karaca is buried. He served in the Ottoman army as a standard bearer. In 1410, his squad was surrounded by enemies. Karaca did not want the banner to fall into the hands of the enemy, so he cut the flag into small pieces and ate it. It is not the end of this incredible story - when the squad was finally victorious, the companions of Karaca doubted the truth of his story, so to convince them, this crazy soldier cut his stomach and showed them the pieces of the standard inside. 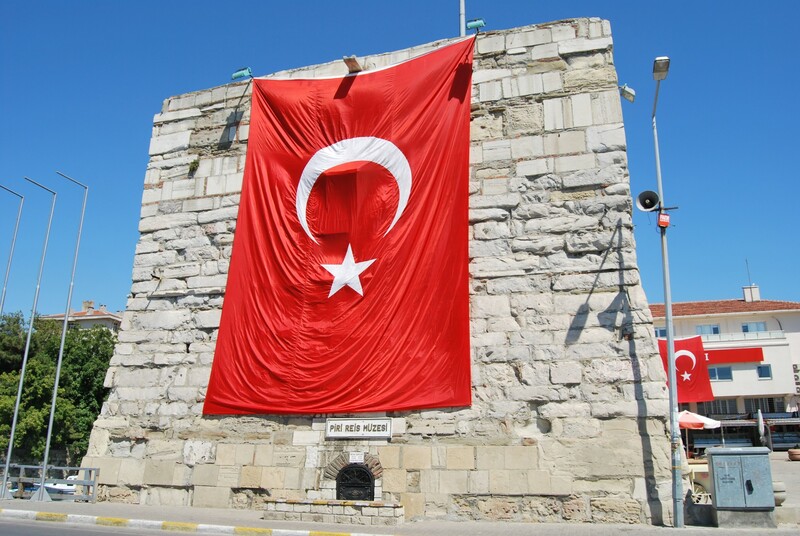 Visiting the tomb is free of charge, but you can spend some money to buy a Turkish flag and put it on the grave of Karaca. Lighthouse Street continues towards a hill rising on the seashore where, naturally, there is a lighthouse (tr. Gelibolu Deniz Feneri). It was built by the French during the Crimean War, and its task was to facilitate navigation through the Dardanelles Strait. It stands on a 50-meter-high cliff and is 25 meters high. Apparently, its light can be seen at night from a distance of 30 kilometres. 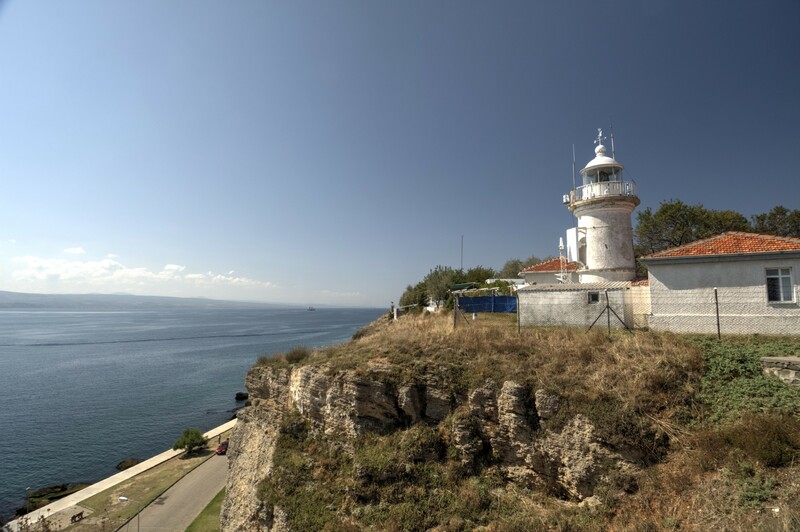 The lighthouse, still operational, is currently managed by the Turkish Coast Guard. If you turn back towards the Tomb of Mansur Al-Hallaj, the most attractive walking route takes you further to the north, down Muhittin Reis Street. After 200 meters, turn right (to the east), to reach the Tomb of Sarıca Pasha (tr. Sarıca Paşa Türbesi), just 50 meters down the road. 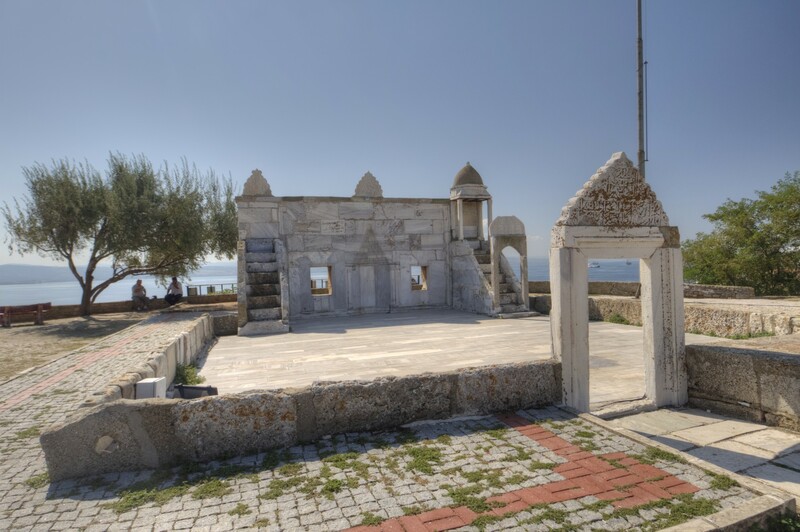 Sarıca Pasha was the founder of the first Ottoman shipyard in Gelibolu, built in 1391. Right next to the tomb there is a magnificent military cemetery, known as the French Cemetery (tr. Fransiz Ölüklüğü). You can see it from afar, thanks to high, snow-white belfry. The soldiers buried were members of the troops fighting during the Crimean War (1853-1856) and the First World War. During the Crimean conflict, France, along with Britain and Sardinia, were on the side of the Ottoman Empire, fighting against Russia. The soldiers who died in the First World War came to this area from Senegal, then a French colony in Africa. During the First World War, the French troops fought against the Turks. The soldiers who died in both military conflicts rest in a cemetery in Gelibolu. It is worth visiting this neighbourhood and ponder over the volatile political alliances and the fate of ordinary conscripts, thrown to distant lands to fight bloody battles. From the French Cemetery, it is possible to descend Muhittin Reis 1 Street, to the coast. In the northern direction stretches Hamzaköy beach district, along Kemal Reis Street. If you go all the way to its northern end, over a distance of 1 kilometre, you reach the two-story tomb of Sinan Pasha (tr. Sinan Paşa Türbesi), a son in law of Sultan Bayezid II. The tomb of Emir Ali Baba (tr. Emir Ali Baba Türbesi) is located nearby. 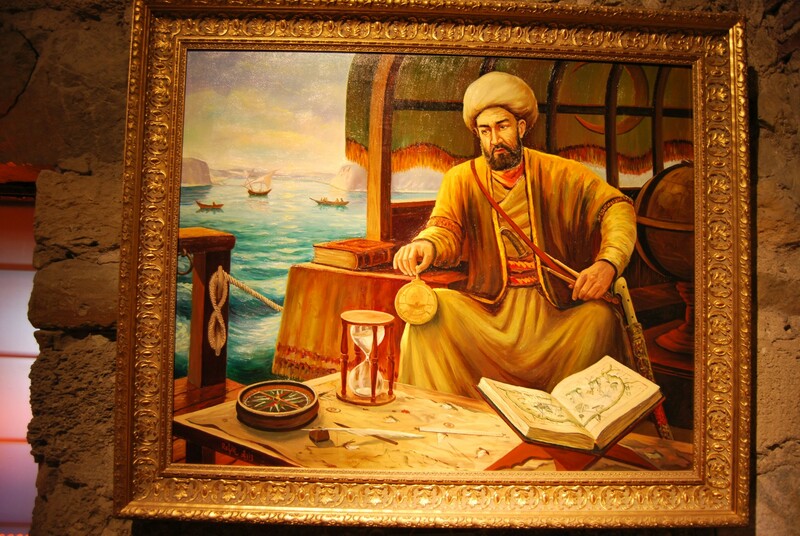 Ali Baba was an admiral of the Ottoman fleet in the 14thcentury. His main achievement was the conquest of Imralı Island on the Marmara Sea. This island, formerly known as Kalolimnos, now serves as a prison and a military base. In this prison, Billy Hayes was serving a life sentence after getting caught as a drug smuggler. After a daring escape from the island in 1975, Hayes fled from Turkey, and then wrote a book "Midnight Express." Later, a famous film was produced with the same title. If you follow to the north, inland along Muhittin Reis Street instead, and then turn left (to the west), then after 500 meters, you will reach the impressive edifice housing the Mevlevihane i.e. the lodge of whirling dervishes from Gelibolu (tr. Gelibolu Mevlevihane). In this building so-called sema ceremonies take place regularly. These ceremonies are a characteristic form of prayer, during which the dervishes rotate in a trance. The building draws your attention to its unusual exterior, especially the double staircase leading directly from the street on the upper floor. Some experts argue that this is the biggest dervish lodge in the world. 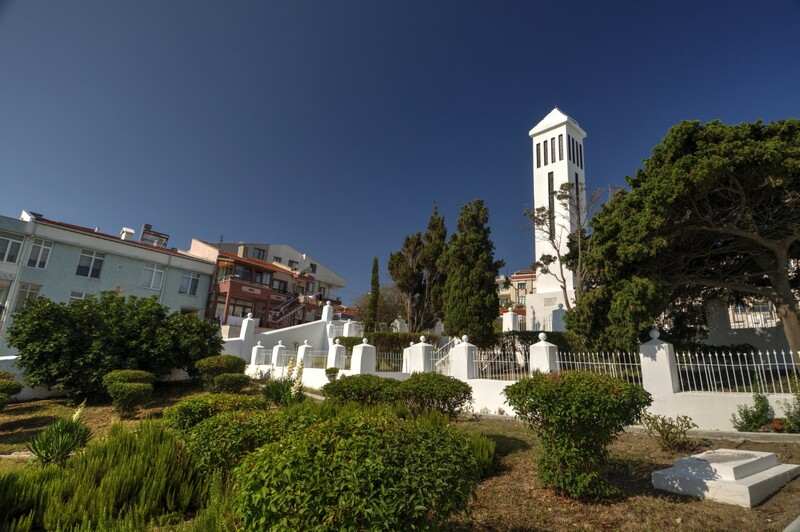 You can also shorten a walk around the city, by going down to the coast from the French Cemetery, and then turning to the south, along the coastal Ahmet Başyurt Sahil Street. It goes around the promontory jutting out into the waters of the Dardanelles. On the northern side of this promontory, there is a pier where you can take lovely photos of views of Gelibolu, a local bay, and the entire strait. Cormorants usually sit on the rocks protruding from the water. 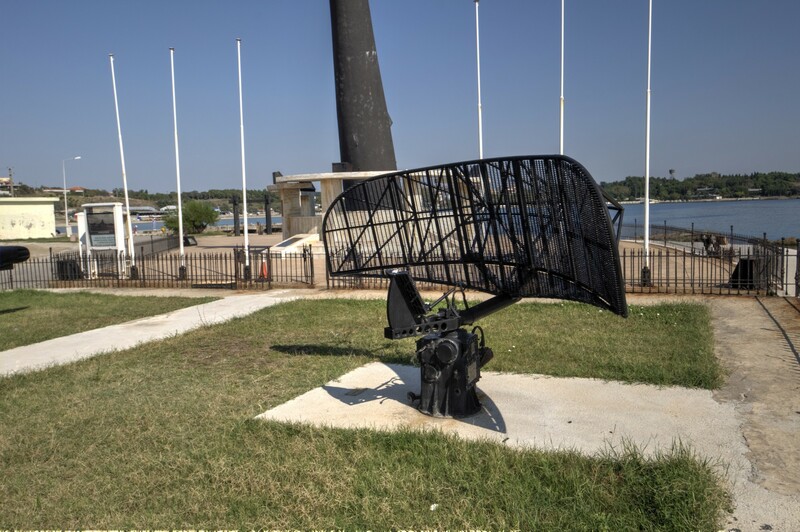 On the promontory, there is the Naval Heritage Park (tr. 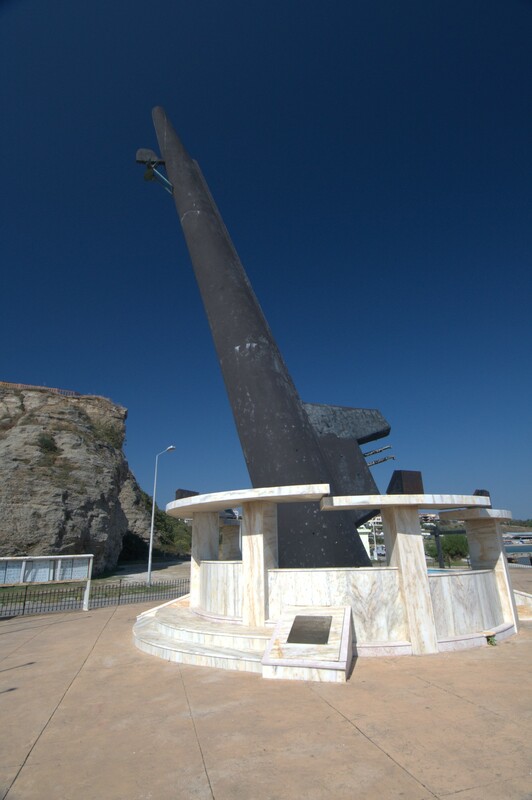 Deniz Kuvvetleri Kültür Parkı), with an exhibition of underwater mines, torpedoes, and even a submarine. The road running along the coast road changes its name to Ordu Evi Sahil Yolu Alti. After walking 250 meters from the Naval Heritage Park take a turn to the right, into Fener Altı Street. At the junction a small plaque announces the location of the so-called House of Experiences (tr. Çilehane). 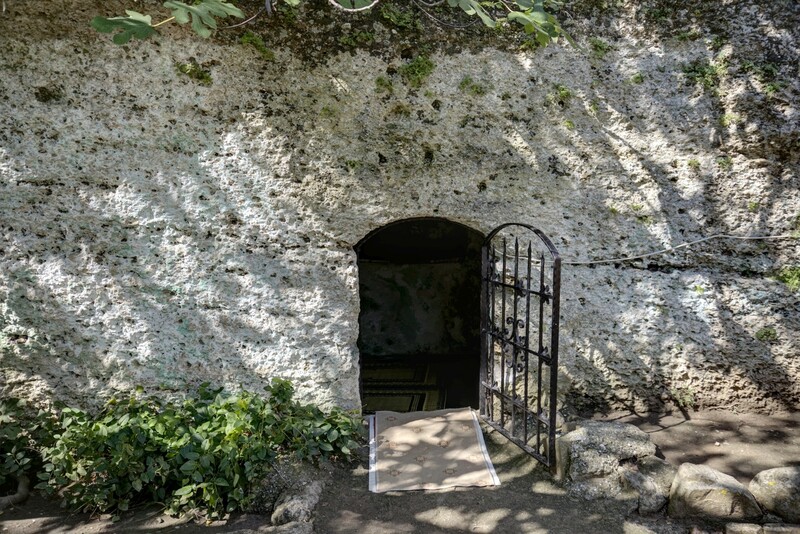 In reality, this "house" consists of two tiny rooms, carved in the rock, for prayer and meditation. You can go inside and try how claustrophobic conditions influence your mood. Older residents of the city still benefit from this hermitage. The place and its garden are cared from by an attentive guardian, who can show you around for a small donation. A path leads from Fener Altı Street to a park located on a hill, where the already mentioned lighthouse is situated. At the entrance to the park, there is the tomb of Kalafat Mehmed Pasha (tr. 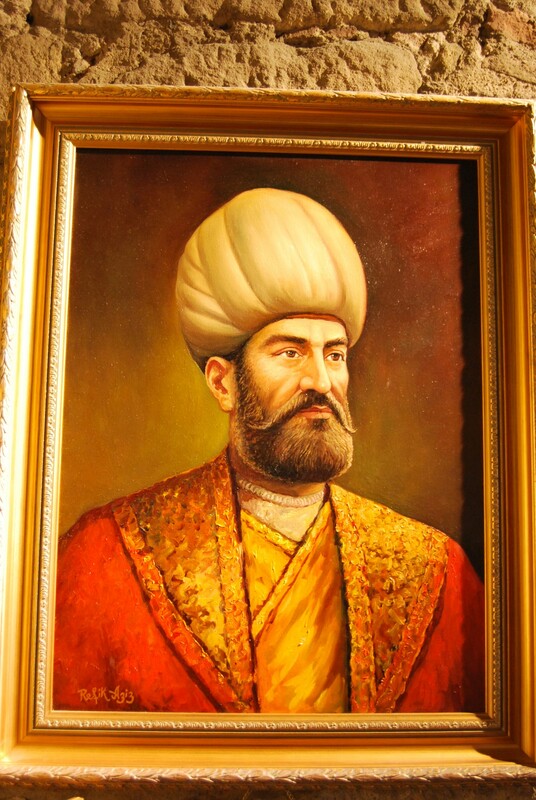 Kalafat Mehmet Paşa Türbesi), who served as grand vizier at the court of Sultan Abdulhamid I in the years 1778-1779. The last point of the walking tour is an impressive structure called Azebler Namazgah, located next to the tomb of Kalafat Mehmed Pasha. It is a rare example (in Turkey) of an open-air Muslim prayer space. The highlight of this venue is an unroofed building erected from marble blocks, erected in 1407. It resembles the interior of the mosque, along with two pulpits (tr. mimber) and a niche indicating the direction to Mecca (tr. mihrab). Gelibolu is located on the eastern side of the Gallipoli Peninsula, on route E87 (D550) that connects the area of northern Thrace with the town of Kilitbahir in the south of the peninsula. There are two access roads to Gelibolu from the E87 route, of which the main, southern one, leads along Korean Heroes Street (tr. Kore Kahramanlar), straight to the harbour. 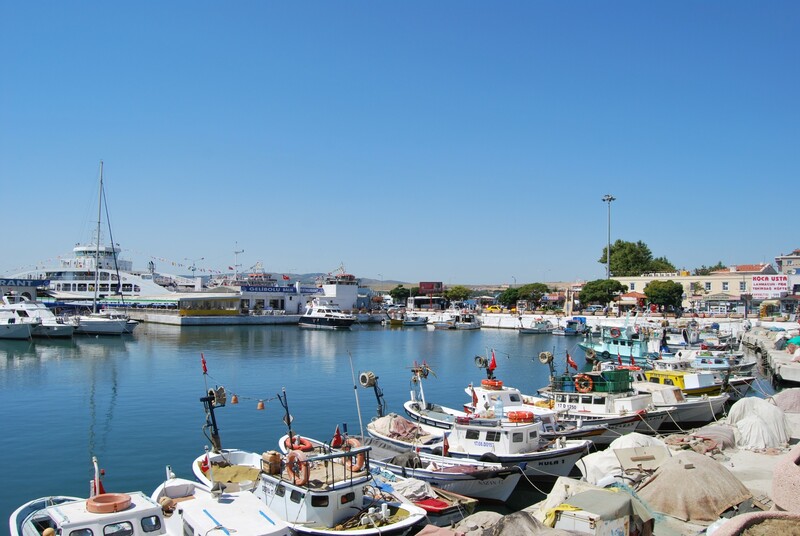 In this harbour, you can embark on a ferry that will take you to the Asian part of Turkey. The second access road to Gelibolu, the northern one, takes you to the city centre along November Street (tr. Kasım Caddesi). It finishes at Gazi Suleiman Pasha roundabout (tr. Gazi Süleyman Paşa), which is adorned with the statue of this commander. From this roundabout, the streets lead to various districts of the city. In the vicinity of the roundabout, there are many service outlets, hotels, banks, restaurants, and grocery stores. The city centre is located on the tip of a promontory jutting out into the waters of the Dardanelles. The ferry harbour is on its southern side, and Hamzaköy Beach district - on the north-eastern side. The promontory is the very centre of the city, and the best way of getting around it is on foot. The streets here are narrow and crowded, often blocked or one-way only. The gastronomic scene in Gelibolu is well developed, and the premises are aimed mainly at the Turkish clientele, so do not expect menus in foreign languages or English-speaking staff. Among several restaurants that are situated at Gazi Suleiman Pasha roundabout, we particularly recommend a small eatery (tr. lokanta) known as Ata Köfte. In addition to the speciality of this venue - meatballs (tr. köfte), you can order soups, rice, and chicken kebabs. Other notable restaurants are located near the ferry terminal. The bakeries in the area specialise in the preparation of the so-called Turkish pizza (tr. pide). You can also enjoy a cup of tea in the family tea garden Nezih Aile Çay Bahcesi, or try roasted sheep intestines in Fotörlü Kokoreçci restaurant. The most exclusive fish restaurants in the city are located just next to the harbour. Among them, the most highly recommended is Ilhan, which serves sardines (tr. sardalya), baked in a clay pot, a speciality of Gelibolu. Several restaurants and bars operate in Hamzaköy district, along Kemal Reis Street. These venues are mainly ice cream parlours, pastry shops, and bars, but their activity is often seasonal. In Gelibolu, there are many shops, supermarkets, and discount stores. The largest supermarket, a branch of Kipa chain (i.e. Tesco), is located on D550 road, on the western side of the city. The largest bazaar is held on Tuesdays, near Muhittin Reis Street. Many banks have their branches and ATMs in the vicinity of the ferry terminal, on Zübeyde Hanım, Belediye, and Atatürk streets. The post office operates on Cumhuriyet Okulu Street, about 650 meters to the north of the ferry terminal, and on Gölcük Street, 500 meters to the north. Gelibolu is often treated by travellers only as a transit point on their sightseeing route. It is connected by the ferries to the town of Lapseki, located on the Asian shore of the Dardanelles. Many people start a tour of the memorial sites on the Gallipoli Peninsula from Gelibolu, but they do not spend much time in the city. However, if the circumstances allow spending a few hours here, for example, waiting for a ferry, you can find some interesting places and buildings, but do not expect too much as there are no world-class great museums or monuments here. By coach: Gelibolu coach terminal is situated 500 meters to the west from the ferry terminal, on Korean Heroes Street (tr. Kore Kahramanlar). There are frequent connections to Istanbul (5 hours, 45 TL), Edirne (3 hours, 35 TL), and Tekirdağ (3 hours, 25 TL). By minibus: minibuses wait just outside the ferry terminal. They can take you to the southern part of the Gallipoli Peninsula: to Eceabat (1 hour, 5 TL), and Kilitbahir (1 hour and 15 minutes, 5 TL). By ferry: every hour a ferry departs from Gelibolu to Lapseki, on the Asian shore of the Dardanelles (30 minutes). The ticket costs 29 TL for a passenger car (all passengers are included in this price), or 2.50 TL per person. By car: Gelibolu is located on E87 (D550) route that connects this town with Edirne (180 km), Uzunköprü (111 km), Keşan (70 km), and Bolayır (14 km) - in the northern direction. E87 (D550) route goes further to the south, to Eceabat (53 km) and Kilitbahir (57 km). To continue the journey to Asia Minor you can take a ferry, from Gelibolu, Eceabat, or Kilitbahir. It is also possible to get to Asia via Istanbul (300 km), first going to Keşan and then taking the D110 route via Malkara (95 km) and Tekirdağ (155 km). Accommodation options are not particularly abundant in Gelibolu because most of the tourists coming to the Gallipoli Peninsula choose to stop in Çanakkale, located on the Asian shore of the Dardanelles. 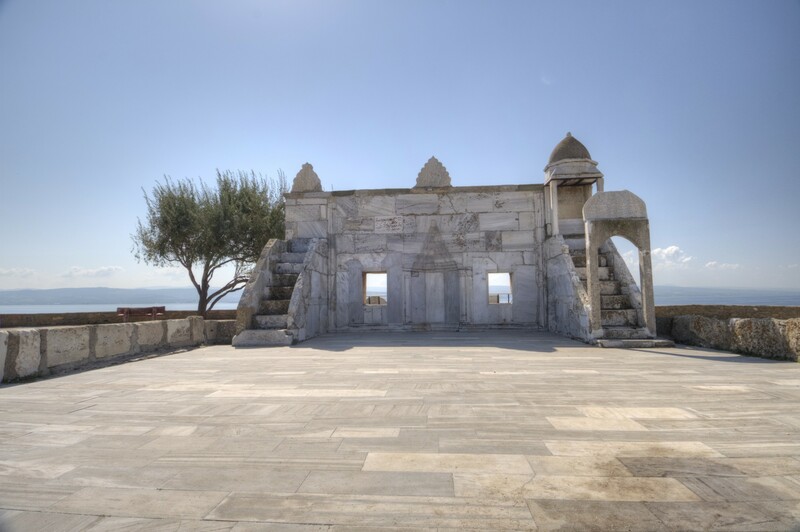 Çanakkale is selected due to its proximity to the battlefields and military cemeteries on the peninsula, but also to the ruins of the famous ancient city of Troy. If you plan to stop for a night in Gelibolu, remember the dates of the anniversaries of the battles of Gallipoli. Book your accommodation well in advance if you plan a stay in March or April. In other months of a year, it often turns out that the prices offered via online booking platforms are much higher than if you go directly to the selected hotel and ask for a room. Hamzaköy Blue Park Boutique Hotel - best-rated hotel in the city, located on Kemal Reis Street No. 41, in Hamzaköy district. The hotel has a restaurant and offers spacious rooms with the views of the Dardanelles Strait. Expect to pay 190 TL for a double room with breakfast. Gelibolu Hotel - in the same area as the previous one, but a little further from the coast, on Celal Nuri İleri Street No. 41. The hotel does not have a restaurant, but the price includes an open buffet breakfast. The price for a double room is 180 TL. Oya Hotel - conveniently located near the ferry docks, on Miralay Şefik Aker Street No.7. Accommodation for two people with breakfast costs about 170 TL. Gallipoli Konukevi - a little further away from the harbour, on Miralay Şefik Aker Street No. 27. It is probably the most expensive lodging option in town - you have to pay as much as 360 TL per night for a double room with breakfast. An interesting idea for accommodation near Gelibolu is Kalanora Resort Hotel, located in the village of Sütlüce, about 7 km to the south of Gelibolu. It is a holiday complex located in a quiet area, consisting of bungalows that surround a swimming pool. The on-site restaurant serves superb dinners. One night in the smallest apartment costs 135 TL for two people, with breakfast included in the price.